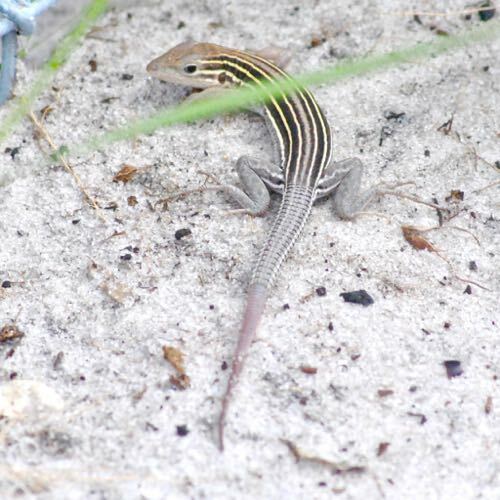 Six-lined racerunner, photographed at Seacrest Scrub Natural Area, Boynton Beach, Palm Beach County, in September 2013. 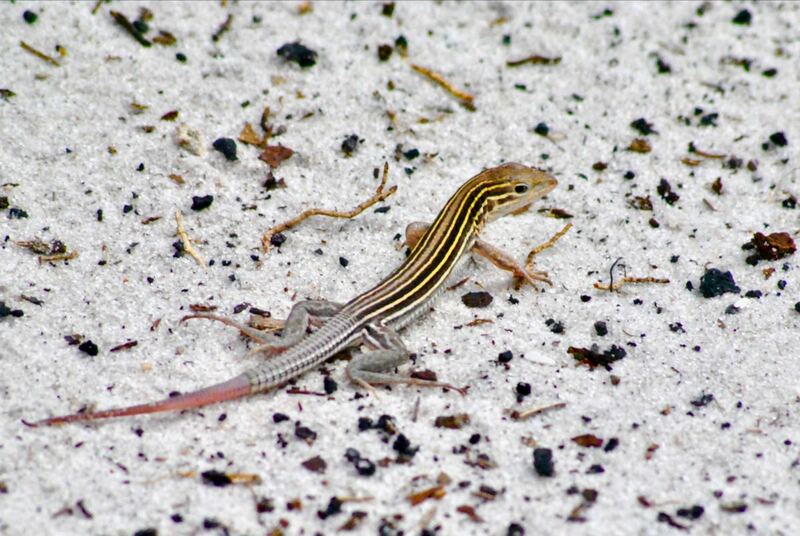 The six-lined racerunner, Aspidoscelis sexlineata, is aptly named. The six yellowish lines along the side of its body are easy to spot. Less obvious, at least at first, is the speed with which it can move — up to 18 mph. That won't beat Usain Bolt to the finish line, but it's plenty fast enough for this lizard to grab lunch or avoid becoming one for a hungry predator. Given its size, its ability to scoot is absolutely stunning. And, as we found out trying to photograph one, it doesn't take long for one to get to top speed, especially during a hot afternoon. The other thing you notice about the six-lined racerunner is its oversized tail, which can be more than twice the body length. That's the inspiration for the lizard's second name, the whiptail lizard. In fact, whiptail is the name of the family of 17 lizard species, of which the six-lined racerunner is one. All in all, from the tip of the snout to the tip of the tail, a six-lined racerunner can reach 12 inches, males slightly smaller than females, though some sources say the six-lined lizard tops out at slightly under 10 inches. The difference could be due to geography. 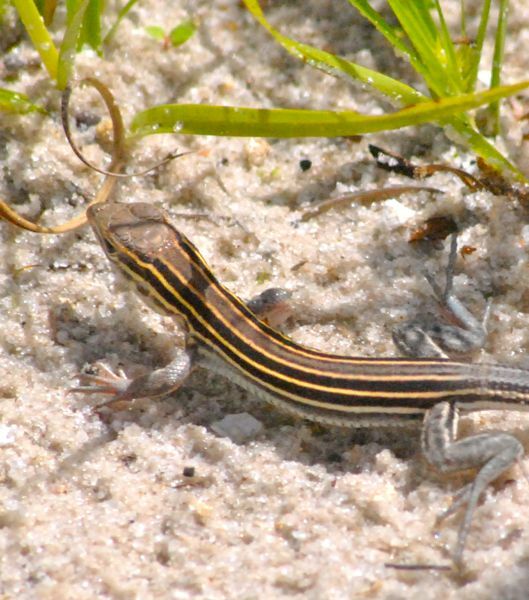 Six-lined racerunners are also terrestrial creatures, sticking to the ground rather than climbing trees like many other lizards. The combination of features, habit and habitat make it an easy lizard to identify. These guys can be found as far north along the eastern seaboard as Maryland, inland to Michigan, Wisconsin and Minnesota, as far west as South Dakota and Wyoming, south into Texas and northeastern Mexico. They're common throughout much of their range but considered threatened in Michigan. They like open habitats; in Florida, you'll find them in dry areas, like scrubs, coastal dunes and open woodlands. Six-lined racerunners are heat lovers, active even on the hottest days. But they'll eschew damp, shady places, like deep forests and swamps. At night and during cooler weather, they'll retreat to burrows. They like to eat bugs, including ants, crickets, flies, moths, grasshoppers, spiders and other invertebrates. They tend to do their hunting during the warmest part of the day, skulking in clumps of grass, darting out to seize a meal. In places, including Florida, their appetite for bugs plays an important role in controlling agricultural pests. And they do have large appetites considering their size. Females lay four to six eggs, sometimes under a log or rocks, sometimes digging a side tunnel in a gopher tortoise burrow. The young hatch a few weeks later. Maximum lifespan for a six-lined racerunner is six years. A taxonomic note: six-lined racerunners are also known scientifically as Cnemidophorus sexlineatus. They are members of Telidae, the family of whiptail lizards.